EU suppliers of electronically delivered products and electronic services are no longer obliged to charge VAT, for customers located outside EU. Price: €40.00 - with no VAT applied! 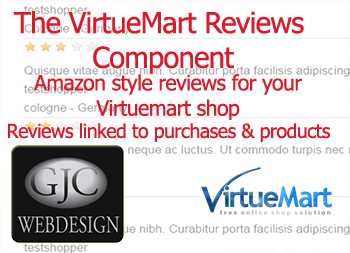 This is the VirtueMart 3 Product Review Component that provides an 'Amazon' like product review. In other words users can only review products that they have actually bought. The Admin can of course add new reviews and moderate/edit existing reviews. Child products display all the reviews of their siblings. The reviews are fully compatible with Google Rich Snippets. See a live demo at VirtueMart 3 Product Review Test Site to see how it works! You can read lots more about it from our Virtuemart 3 Product Review Package Instruction PDF. When you fill out your registration, if you are outside the EU the tax will not be charged! When you buy you will be directed to Paypal where you can pay as a Paypal member or Credit Card. You will then receive an email with a link to download the zip file.